If you're looking for a new pair of powered studio monitors, you're essentially balancing your budget against the desire for the most accurate sound reproduction possible. With the HS5 active studio monitors, Yamaha pushes this cost-to-benefit ratio for you further than ever before. The HS5s offer fantastic flat tonal response, while presenting dynamic ranges clearly. They employ a bi-amplified design for undistorted signal across the entire audible spectrum, and precision adjustment controls that let your HS5s shine wherever you install them. Much of the innovation in the HS5 series lies in the cabinet design. For inspiration in rethinking the HS5's housing, Yamaha drew on their 100 justly celebrated years of piano design. And from their pianos, they developed a three-way mitered-joint technique for these cabinets. This makes them not only minimally cross-resonant, but extremely durable as well. Along with good cabinet design, the quality of any monitor comes down to the speakers that it employs, and how they are mounted. 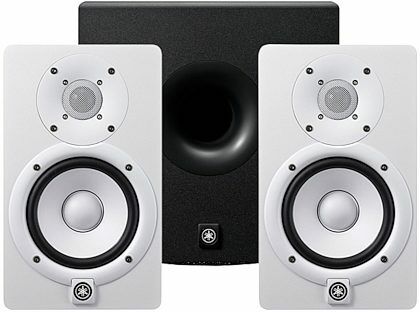 The attractive white 5-inch cone woofer and 1-inch black dome tweeter in each HS5 sits in a uniquely redesigned mounting ring, eliminating the unwanted vibrations that make lesser monitors harder to trust. Each monitor also employs an extra-large magnet, creating a more uniform flux field. This yields a smooth response and greater dynamic capability over a wider frequency range. The magnets themselves are selected to provide the greater possible fidelity in the low-end frequencies, which is typically the hardest range to manage when mixing audio. The tweeter frames in turn are built extra-thick, minimizing interference in the high end. The HS5's 2-way bi-amplified design means that the woofer and tweeter are powered by separate amps. This eliminates undesirable interaction between the units, and any signal distortion resulting from phase difference. 5.1 and 7.1 surround sound system are continuing to become more commonplace in public and private music listening settings. But a little obvious arithmetic points out that building a surround system for mixing is at least 2 1/2 times more expensive than a stereo setup! And here's where the HS5's price point proves so seductive. With these monitors you can be up and running on a totally balanced surround setup for a more manageable price. If you combine five or more HS5s with a 120 watt subwoofer (like the Yamaha HS10W) you'll have a professional-grade surround sound mixing station on your hands. Apart from the design of a monitor, the single greatest factor influencing accuracy is the room where they're located. Room size, shape, and surface materials all affect what you're hearing during playback. The HS5 gives you Room Control and High Trim controls for good room-matching. You'll tweak the Room Control setting to compensate for unnaturally exaggerated low end. Then use the High Trim switch to get the treble in the right place. The Yamaha HS5 is a 2-way bass-reflex bi-amplified near field studio monitor with 5" cone woofer and 1" dome tweeter. Yamaha HS Series cabinets are designed to eliminate unwanted resonance and increase the accuracy of sound reproduction to their extreme limit. Drawing from Yamaha's over 100 years of piano design experience, HS Series engineers also employed a traditional three-way mitered-joint technique to dramatically improve durability and eliminate unwanted resonance. Sound: They say what's important about monitors is that you learn how they translate onto other systems. I can say that these translate very well onto other systems. What I'm saying is that what I hear, or don't hear, on these monitors is just about the same as in my cars or home stereo systems. I don't have to worry about any stray sound surprising me when I'm playing a track elsewhere. So the monitor "learning curve" I believe is not very steep with these. I have a pair of 8in Rokits that, while not a bad set of monitors, are my B set. Truth is I rarely turn them on because the bass representation of the HS5 is pretty darn accurate. I really don't need a bigger monitor for the area that I'm mixing in. A home recorder/mixer would do fine with a pair of these if the room is fairly small. I think I read somewhere that someone believed the high freqs are over-represented on these. I think that would be possible in an untreated room. I would advise to take that into consideration because if you think a frequency is over-represented, you'lll probably under-represent it in the mix Feature: Monitors are usuallly not a feature rich piece of equipment....couple switches in the back, level knob, 1/4in and XL ins. Ease of Use: I'll say that I mix twice with these- bounce the first mix, listen, then mix/tweak again. The second mix is usually right where I want it to be, and the adjustments are usually small because the first mix was as accurate as I heard it on the monitor. My second mix/tweaks are usually some things I want to change- not something I heard differently. Quality: They're heavy for their size. Seem to be well constructed too. Value: I'll never regret buying the HS50M. I'm really impressed with what I can do with them. That's taking into account my current mixing environment. My room is a bit treated and small (~12ftx10ft). Manufacturer Support: I haven't dealt with them. The Wow Factor: No wow factor. After years of being wowed, I despise the Wow Factor. The wow factor is a paved road to Craigslist most of the time. Overall: I thought I had reviewed these before, but it turns out that I reviewed the HS50M instead. They are very similar. I've had my HS50M for over a year now so maybe I can write a better review and perhaps the HS5 are just as good or better. 16 of 17 people (94.12%) found this review helpful. Did you? "Now I see what all the hype is about"
Overall: All of my recording buddies raved about these being the monitors to have in my home studio. I put it off for years because I just couldn't believe they could be that much different than other monitors ... WRONG! I hear everything like I should... EVERYTHING! The hype is legit, won't sleep on Yamaha ever again.